Summary: Female shoppers put the proverbial mailman to shame, braving the inclement weather to procure Christmas presents. 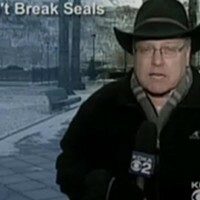 Reporter: Paul Martino, KDKA Channel 2 Airtime: 1 minute, 15 seconds on Dec. 19 Visuals: * The crunchy mall parking lot, where shoppers -- all dressed appropriately for the weather, which should please KDKA immensely -- scrape ice from their cars after a full day of shopping. Highlights: * When anchor Stephanie Watson warns, "There is less than a week until Christmas, and this snowstorm is making life difficult for those last-minute shoppers." 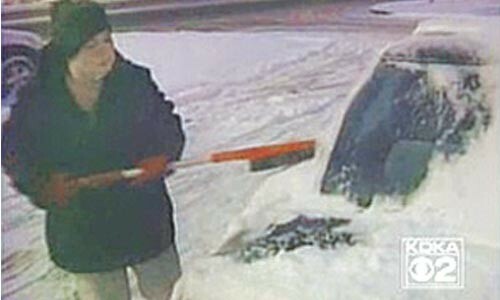 * When Martino, dusted with snow in the parking lot of Pittsburgh Mills mall, leads, "I think the retailers had to be sweating it out when this storm hit today. But judging from what we saw [here] today, well, the snow is not keeping too many shoppers home at all. Here is the scene ... the parking lot is full, shoppers are digging out after a day of shopping there, but they could not stay away. They had to pick up those last-minute presents. And some even tell me that the snow inspired them to go shopping." * When a middle-aged woman in a jaunty red coat with a Santa brooch exclaims, "My God! I was so surprised that there were so many people here. So the roads couldn't be too bad." * When a 40-ish female shopper, hands full of bags, says, "It's perfect Christmas-shopping weather. ... It gets me in the spirit. I think it's fun." * When a younger female shopper agrees: "I actually love snow, and I think we might get our first 'white Christmas' in a long time." * When Martino considers, "That is true. It's been a while since we've had a white Christmas here in Western Pennsylvania, and it looks we might get one, and looks like the shoppers are going at it pretty strong tonight." What We Learned: When it comes to Christmas gifts -- Armageddon-like weather be damned -- there's no time like the present to shop. Unanswered Question: What did these shoppers buy? I love seeing the inane things people will risk their lives for! News Value: 1. This is a perfect example of the folks back in the newsroom not having a clue what a story is actually about. Despite Watson's ominous intro, at most the weather was a mild nuisance. By the way -- the odds of Pittsburgh having a white Christmas, according a source cited on Wikipedia, are 33 percent. Call your bookie!